Cut the cord this Thanksgiving with a Roku, Amazon Fire TV stick, Chromecast, Nvidia Shield TV or Apple 4K TV. 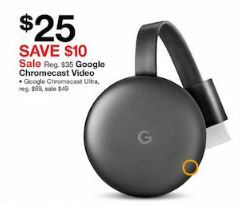 Find the best deals in Black Friday ads and Cyber Monday sales during Thanksgiving weekend 2019. Roku is one of the original cord cutting solutions. Every device can stream Netflix, Hulu and other full HD channels. 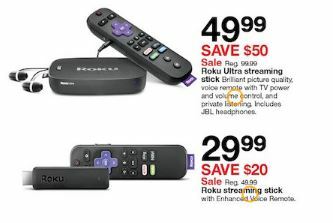 The Roku Express is the cheapest option and provides a barebones solution for full HD. The Streaming Stick+ provides portable and fast access to 4K HDR content for your TV. The Roku Ultra is the top of the line product intended for people with home theater systems due to the additional ports for better integration, otherwise the Premiere+ is the top Roku box capable of 4K and HDR playback. A streaming media device for 1080p HD television content made by Amazon with tens of thousands of channels and apps. The latest version includes the Alexa Voice Remote. The Apple TV is a device to watch select movies, shows, live sports and news. The 4K TV device provides for 4K HDR video. The latest version of the device is the fifth-generation sold by Apple. 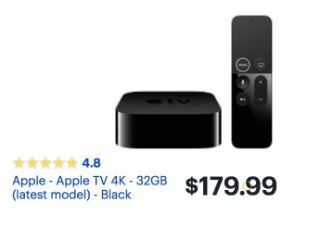 AT&T is advertising a deal on the Apple TV 4K box for new DirecTV Now subscribers. The regularly priced box of $179 is free with prepayment of four months of the $35 a month service. 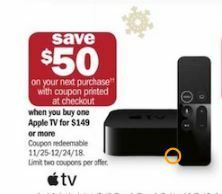 In sum, new subscribers receive a $39 discount off the regular price of the Apple TV and get four months of DirecTV Now for what is essentially free. A media streaming device that plugs into your TV’s HDMI port and plays TV shows, movies, sports, music and more. It also works with hundreds of apps including Netflix, Youtube, Pandora and HBO Now. The first generation was released in 2014. The second generation of the device was released in September 2015. 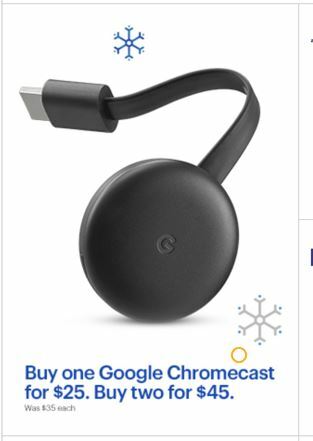 The Chromecast Ultra was released in 2016 and supports 4K resolution and HDR video. We have been combing the Black Friday ads for almost a month now to bring you the best deals during Black Friday 2019. We will continue to scan the print and online ads released and leaked through Cyber Monday 2019. We hope you found this page helpful and will take a look at the other electronics deals that we have found. Some of them are simply too good to pass up! If you didn’t find what you are looking for, please stop back again shortly as deals are still being released in the run up to Thanksgiving Weekend and most stores have not yet announced their Cyber Monday deals. We will add deals for cable alternatives here as they are released.